In an era when music programs are being cut from schools and software has made instrumentation cheaper and more accessible, people aren't rushing out to buy acoustic instruments. In 2000, 105,000 new pianos were sold in the United States. In 2009, only 30,000 new pianos were sold. 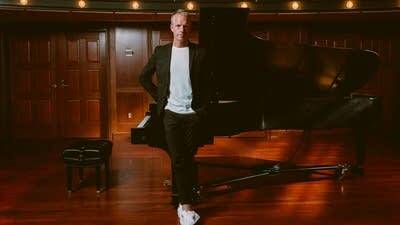 Composer, pianist and Steinway & Sons artist Chad Lawson is trying to revive interest in the piano by modernizing it for what he calls the "Spotify generation." Lawson created his latest album Re:Piano armed with his instrument and an iPad full of digital effects. Lawson says that since the 1700s, listeners have had the same notion of what the piano is supposed to sound like, and that popular music doesn't often sound like that anymore. He says that a lot of the millennial generation hasn't been exposed to piano the way older generations have. "They haven't really grown up with a piano in the house, or if they have, they don't know how to turn it on," Lawson says. "I wanted to say, 'Hey, let's take something like the piano and let's put some new paint on it. Let's give it a new voice.'" On tracks like "All Is Truth," Lawson creates piano patterns, then loops them with the iPad and uses effects that create tinkling, metal sounds in the background. He layers his loops to create an ethereal texture that obscures and transforms the instrument from its origin. Unlike his traditional songwriting process of creating chords and then a melody, Lawson says composing Re:Piano was more improvisational. His live performances of the album are that way, too. "When I walk out on stage with the iPad, I start with a pattern. It's something that I've not prepared," he says. "I just build upon that." He compares the improvised result to a dish on the reality cooking show Chopped. "I love limitations," he says. "That's the great thing about it. You have just this to work with. What can you do?"